My acrylic and oil paintings are alive with color, movement, and light. I paint, as life truly exists, in vibrational energy patterns. With heightened awareness, I weave the inner and metaphysical worlds to our outer world. The vibratory field that connects all things is revealed. The foundation, the malleable structure of the painting, is created by washes of color. Then developed with lines and shapes, glazing, and impasto (built up layers of paint). 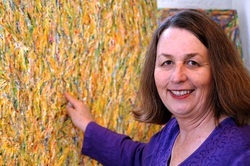 Francine Kohn's Evolutionary Moving Pictures weave layers of unique transparent and translucent, glowing and shimmering color harmonies with glazing techniques from the Masters. Her original use of acrylic/oil colors at first glance appear as colored spaces and lines. Colors directly opposite each other in the color spectrum, such as red and green or blue and orange layered cause the eyes to see 'flickering and movement' in geometric patterning. Dots, lines, circles, arcs, and/or spirals are in my art. Pictures emerge and continue to evolve across the canvas. A crescendo occurs when the marks mix with the colors, similar to the climax achieved in music and literacy to achieve the completed moving work. Further viewing creates images and shapes appearing, then moving across the canvas. Each painting celebrates vignettes of passion, power and perception, capturing the sensory and meditative qualities of nature. The suggested kinetic imagery shows how everything is connected. These vibrant, organic and colorful “moving images” are the space where art, science, spirituality and magic come alive. Their roots are in Western art, Hindustani music, Nichiren’s Buddhism, alternative ways to discover the nature of ourselves, how we perceive and reality, supra-real life experiences, and technology. She calls these dynamic, vibrant works “Art that Moves You”. You are invited to join a growing list of admirers and collectors including: John Hersey, computer illustrator; Joni Yacoe, psychotherapist; Tecta Associates, San Francisco architects; Luis Nieves, CEO of AUL Corp; Dr. Zita Latona & Jeremy Reyes, Esq. ; and Beth Goldberg, contemporary art curator. "I never get tired of looking at Francine's paintings. They are visually stunning.."
"Your paintings got my attention. The 'entoptic' (Greek: 'within vision') geometry caught my eye...like the 'golden section these forms affect people (whether they are consciously aware of it or not).."
"At first site, it's almost overwhelming, but when you sit with Francine's paintings it takes on so many different dimensions that it captures the spirit, a certain quality in you, enhancing your connection to your inner spark.. With very change of light, the paintings change. 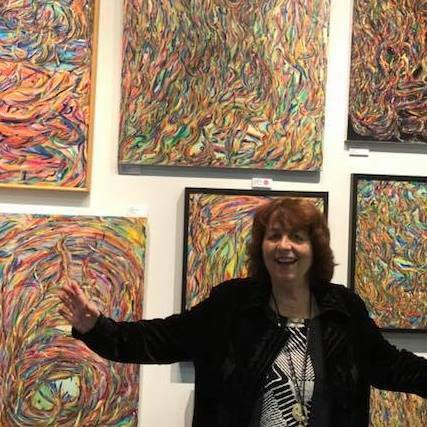 They are alive.."
"Through the vibration and density of the picture plane, Francine Kohn has been able to move through a philosophical and psychic realm that one seldom sees in painting. Using a very personal approach to color and to shape, she has been able to set up intense living relationships that express far more than just themselves. Moving beyond the literal, she yet, through her suggestive intensities gives a life to her works that transcends the usual." "Experience of Love" Flash Creation .